Snow showers will continue in Northern Ireland on Friday night, with some of them heavy in the north and east. 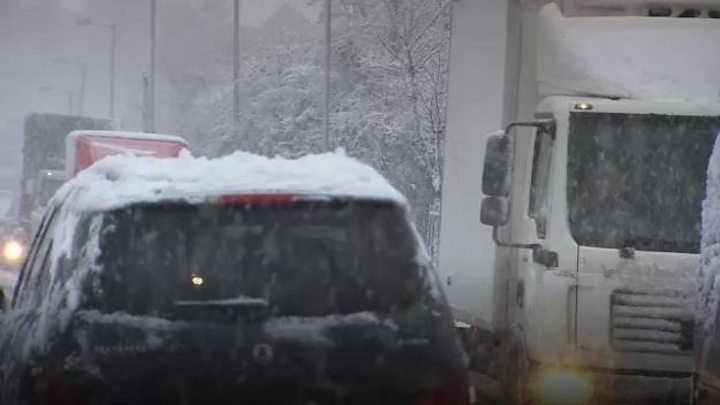 Snow fell across many parts of NI earlier, resulting in travel disruption. A number of schools closed, as did Belfast Zoo. Translink has said it has had to terminate some buses along parts of their routes on Friday evening. There are also a number of delays and cancellations to flights at both the International and Belfast City Airport. 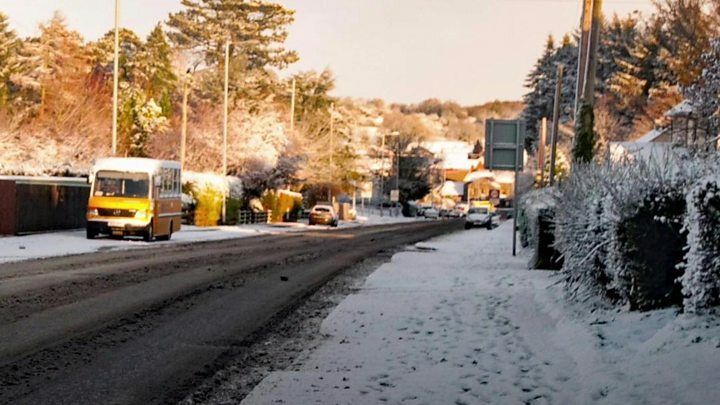 A yellow weather warning for snow and ice is in place until Sunday. Wintry showers will linger across the north and east overnight, while it will become drier elsewhere. There will be widespread frost and ice overnight. with a minimum temperature of -3 °C. As the remains of Storm Caroline pull away to the east, it has accelerated a blast of cold Arctic air southwards across Northern Ireland. This body of cold air has been travelling more quickly than we would normally expect from a north-westerly flow of weather, so it's had less time to warm up as it passes over the sea. What it has done is collect moisture from the North Sea, which is falling as snow as that air rises and cools over the hills of Northern Ireland. That conveyor belt of showers will continue through today, overnight and on into Saturday and we have a yellow severe weather warning for both snow and ice in place until Saturday evening. Police warned motorists to leave extra time for their journeys on Friday. The Rathlin ferry service has been cancelled because of the weather.